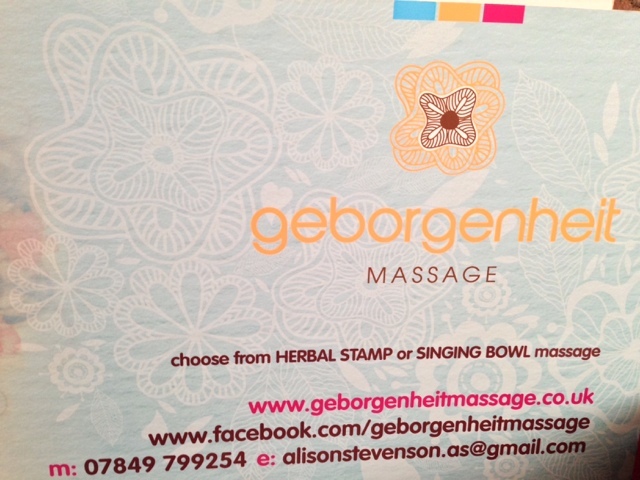 It's just over 24 hours since I had my first ever Geborgenheit Herbal Stamp Massage and it was one of the most relaxing and calming body treatments I've ever had. So much so, I had to blog about it straightaway for any stressed local ladies out there. I have never felt comfortable having full body treatments so any time I do treat myself, I stick to a back massage or a session of reflexology. I have also found that anything that involves your full body is generally expensive and time consuming. Well, I've found my dream full-body treatment and I'm determined to set aside some cash every week for the next few weeks to allow me to have another one during the summer. Let me tell you more. Geborgenheit Massage has been brought to Holywood, Co Down by local lady, Alison Stevenson, who learned the technique in Austria a number of years ago. When I arrived at her cosy and fragrant treatment room yesterday, Alison immediately put me at ease, taking time to tell me more about the massage and to ask about my own health and wellbeing. 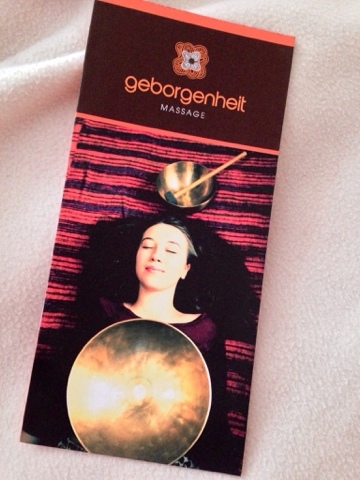 Geborgenheit is roughly translated into English as 'Nurture' and the massage has two elements, herbal stamps and singing bowls. You can have a treatment just involving one of these elements, or in my case, Alison incorporated both. She explained to me that although I needed to take all but my underwear off, my body would be warm and covered at all times. I was encouraged to speak up if I was feeling uncomfortable but advised that other than that, the treatment would be done in silence. If, like me, you are one of those girls who goes into a treatment and suddenly feels the need to talk for Ireland, you'll appreciate this. It's great to be told to be quiet as it's only then that you can really focus on relaxing, breathing and getting the full benefit of the treatment. Alison left me to get undressed and jump under the covers on the treatment table and the massage started with me lying on my back. Both legs are done in turn, followed by arms, hands, décolletage and (if you're agreeable) the most gentle and wonderful abdominal massage. Then I was flipped (!!) over and my back and the back of my legs were done, finishing with my feet. Alison can also do a gentle face and head massage if you wish but I was heading to a meeting afterwards and wanted to keep my make-up on..so she gave me the small herbal stamps (pictured below) to take home and use in my own time. The herbal stamp bags are basically muslin squares filled with millet or couscous and herbs, that have been selected according to your needs. For me, Alison chose Calendula and Lavender to relax and some Rosemary & Lemon Balm to keep me awake for the rest of the day - she is a wise woman indeed! 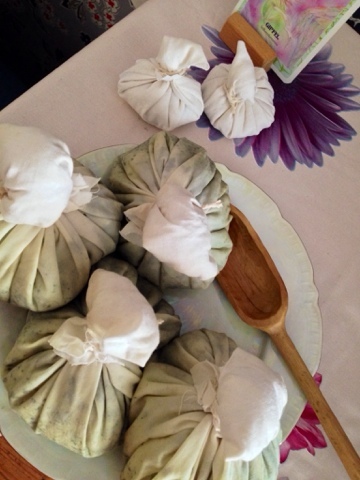 The bags are dipped in hot coconut oil which lubricates them for the massage and allows the herbs to give up their aroma and healing properties. Alison uses the bags to massage with initially and then her hands - to whatever pressure you are comfortable with. 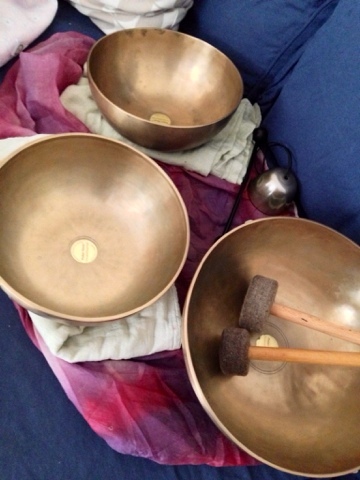 The massage finishes with the singing bowls being placed on each part of the body briefly - they are tapped to create tiny vibrations that are strangely hypnotic. The result is a gorgeous relaxing, skin softening treatment that leaves you feeling amazing. What I liked best about it is that Alison is so down to earth - this is not a posh white coated salon atmosphere...it's much more homely and natural and oh so good for you - I felt detoxified and destressed immediately afterwards and I still feel that way today. The cost is £35 for a 1 hour treatment and you can contact Alison via email or phone (details below). Her treatment room is based in a residential house in Holywood, Co. Down, with ample on-street parking. Additionally, if you're in the area, you can meet Alison and get a taster session at the Helen's Bay Community Garden on Coastguard Avenue on Friday and Saturday afternoons - full details on Alison's Facebook page here. 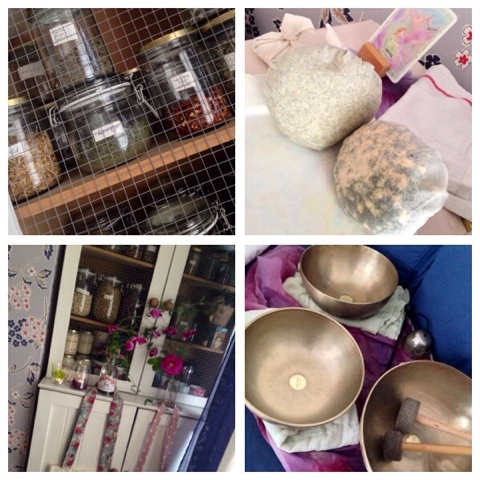 Must get back and try the herbal stamp - I just had the singing bowls on their own and they were pretty amazing! Sounds perfect and something that we could all do with!